Buddha Jayanti, also known as Buddha Purnima, celebrates the birthday of Lord Buddha. It also commemorates his enlightenment and death. It's the most sacred Buddhist festival. Buddhists regard Lumbini (which is now part of Nepal) to be the birthplace of Buddha. Named Siddhartha Gautama, he was born as a prince into a royal family sometime in the 5th or 6th century BC. However, at the age of 29 he left his family and began his quest for enlightenment after seeing the extent of human suffering outside the walls of his opulent palace. He became enlightened at Bodhgaya in the Indian state of Bihar, and is believed to have lived and taught mostly in eastern India. Buddha is believed to have passed away at Kushinagar in Uttar Pradesh, at the age of 80. Many Hindus believe Buddha to be the ninth incarnation of Lord Vishnu, as indicated in scriptures. Buddha Jayanti is held on a full moon in late April or May each year. In 2019, Buddha Jayanti falls on May 18 in India. It will be the 2,581st birth anniversary of Lord Buddha. At the various Buddhist sites across India, particularly at Bodhgaya and Sarnath (near Varanasi, where Buddha gave his first sermon), and Kushinagar. Celebrations are widespread in predominantly Buddhist regions such as Sikkim, Ladakh, Arunachal Pradesh, and north Bengal (Kalimpong, Darjeeling, and Kurseong) as well. The festival is also celebrated in Buddha Jayanti Park, Delhi. The park is located on Ridge Road, towards the southern end of Delhi Ridge. The closest metro train station is Rajiv Chowk. Activities include prayer meets, sermons and religious discourses, recitation of Buddhist scriptures, group meditation, processions, and worship of the statue of Buddha. 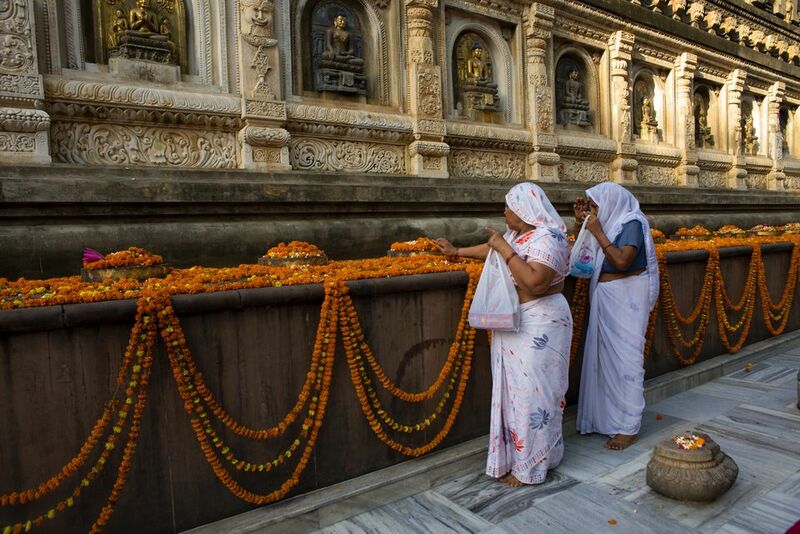 At Bodhgaya, the Mahabodhi temple wears a festive look and is decorated with colorful flags and flowers. Special prayers are organized under the Bodhi Tree (the tree under which Lord Buddha attained enlightenment). Plan your trip there with this Bodhgaya travel guide and read about what it's like to visit the Mahabodhi temple. A large fair takes place in Sarnath in Uttar Pradesh. The relics of the Buddha are taken out in public procession. The National Museum in Delhi also brings the mortal remains of Buddha (what are believed to be some of his bones and ashes) out for public viewing on Buddha Jayanti. In addition, an annual celebratory event is held in Delhi by the International Buddhist Confederation in conjunction with the Indian Ministry of Culture. It's attended by the Prime Minister of India, monks, and various international guests. In Sikkim, the festival is celebrated as Saga Dawa. In Gangtok, a procession of monks carries the holy book from Tsuklakhang Palace Monastery around town. It's accompanied by the blowing of horns, beating of drums, and burning of incense. Other monasteries in the state also have special processions and masked dance performances. Many Buddhists visit temples on Buddha Jayanti to listen to monks give talks and recite ancient verses. Devout Buddhists may spend all day in one or more temples. Some temples display a small statue of Buddha as a baby. The statue is placed in a basin filled with water and decorated with flowers. Visitors to the temple pour water over the statue. This symbolizes a pure and new beginning. Other statues of Buddha are worshiped by offerings of incense, flowers, candles and fruit. Buddhists pay special attention to Buddha's teachings Buddha Jayanti. They give money, food or goods to organizations that help the poor, elderly, and those who are sick. Caged animals are bought and set free to show care for all living creatures, as preached by Buddha. The usual dress is pure white. Non-vegetarian food is normally avoided. Kheer, a sweet rice porridge is also commonly served to recall the story of Sujata, a maiden who offered the Buddha a bowl of milk porridge. Buddha Jayanti is an extremely peaceful and uplifting occasion.